Soviet artist KF Yuon found the most picturesque and canvas-worthy paintings of Russian nature. The master had a house in the Moscow region, where he loved to immerse himself in creativity with his head. Far from the bustle of the city, the village of Ligachevo was captured in many of the painter’s works. 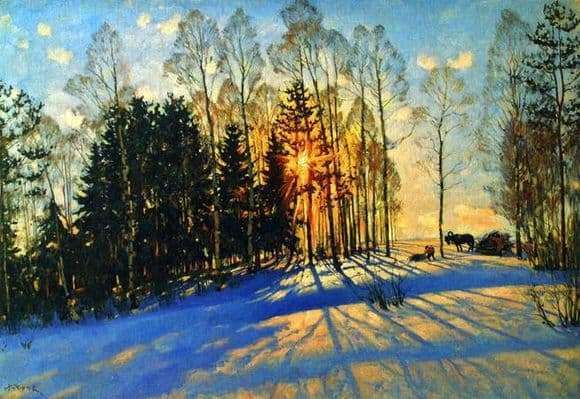 The “winter sun” was caught by the persistent attention of Konstantin Fedorovich in 1916. Most of the paintings are landscape objects. The lower part is covered with a smooth sheet of snow, on top of the blue sky with rare scraps of fluffy clouds. Medium horizontal streaked tree trunks. Large spruces spread out wide and high on the open expanses of land. Their evergreen sloping branches are covered with thick dark green needles. Coniferous grove diluted bare tall trees. The absence of foliage on them lets the afternoon light of the afternoon sun pass to the spectators. Contrary to the frost, shackling nature in the shackles of ice, the golden circle of the sun illuminates everything around with soft warmth. On the right side of the canvas a small plot scene is noticeable. A horse carriage stands in the snow, and a village peasant is near the collection of brushwood. Even this dynamic scene seems to be as still, frozen, like the forest itself, wrapped in anew veil. The winter sun is divided by yellowing with cloud stitches, draws the long shadows of the forest on the snow. From such a picture it becomes light and warm during any bad weather in the soul. The Russian artist shows us how great and beautiful is the winter season. The sunlit space as if penetrates beyond the boundaries of the two-dimensional and gives the audience a sense of presence. As an acknowledged master of landscape, Yuon is also a great patriot and loyal follower of living pictures of nature. The “winter sun” illuminates the hope of the resurrection of the icy world; tender and eternal, it declares its existence again and again with blinding yellow rays.